What we fail to recognise is that such reasoning is not, has never been, and never will be part of Catholic thought. It flies against our sacramental sense of things. The age-old definition of St Thomas Aquinas for a sacrament is “outward sign of inward grace,” constantly reminds us that our material world, so transformed and divinised by the Incarnation, allows us to have a glance of the spiritual and invisible realm. Therefore, St Augustine describes the “church” building as an outward sign of who we are interiorly. "What was done here, as these walls were rising, is reproduced when we bring together those who believe in Christ. For, by believing they are hewn out, as it were, from mountains and forests, like stones and timber; but by catechising, baptism and instruction they are, as it were, shaped, squared and planed by the hands of the workers and artisans. Nevertheless, they do not make a house for the Lord until they are fitted together through love" (St. Augustine, Sermon 36). 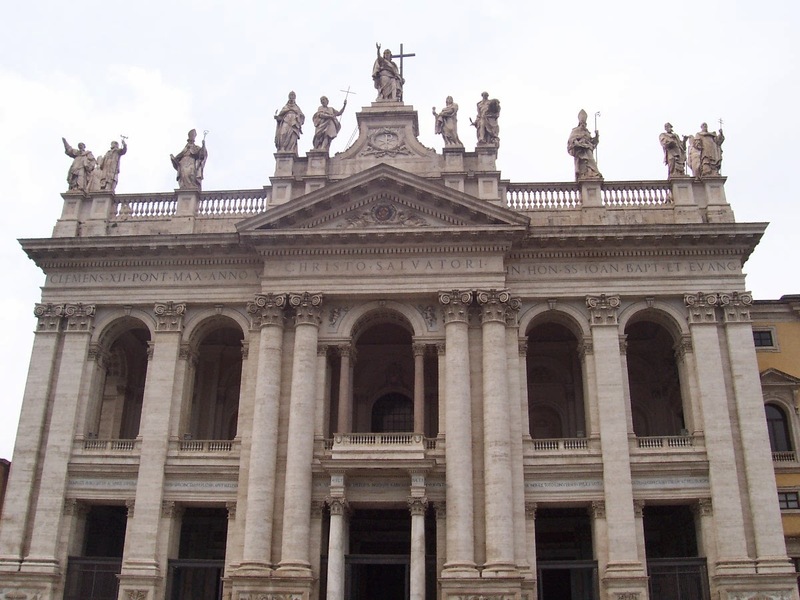 The church is catecheses in stone, therefore, it is properly said to be a sacramental building since it makes present to us the realities of heaven and earth at the end of time. The past, the present and the future converge in this architectural image. In the time of shadow, the Temple of Solomon gave us a look at this future glory. In the future, in the time of realisation of the Promise, the celebrations of heaven will be purely communion and feast without need of material mediation. But now, as beings who perceive through the senses, we human beings require the image. The Church building, with its liturgical arts, tells us in a way that nothing else can, what heaven looks like, who is there, and what the nature of redeemed creation might be like. In short, it gives us a “foretaste” of the realities by way of image. So, a door is not just any door, but a symbol of the Pearly Gates. The holy water font at every door reminds us that baptism is the sacrament that opens the doorway to salvation. The pillars of the Church remind us that the Church of Christ is built on the firm foundation of the Twelve Apostles. The leafy ornamentation above the pillars reminds us of Paradise Regained, where we are permitted once again to feast on fruits of the Tree of Life, once denied to our fallen ancestors. The nave (from the Latin “navis” – ship) of the Church, where the congregation sits, reminds us that we are secure within the hull of the barque of St Peter, the ark of salvation, protected from the raging winds and stormy waves that often threaten but never succeed in breaching the integrity of the Church. The soaring rafters and the company of saints that adorn the Church remind us that we are citizens of the Heavenly City and merely sojourners on earth. The Chair, the ambo and the altar signify to us that it is Christ Himself who shepherds and teaches and who finally offers himself as the Perfect Sacrifice to the Father for our salvation, and who will return on the Last Day to act as both Judge and Saviour. And the Tabernacle with the eternal flame burning at its side reminds us that even in the darkest moments of desolation, when all hope seems lost, Christ is not just symbolically present but truly, really and substantially present to us as food for the journey and the most potent antidote to evil, suffering and death. This is why a church cannot just be viewed functionally. When liturgical architecture presents merely a functional or at least neutral setting or is viewed as a museum of devotional objects, then the consequences are dire. There is truism in the ancient maxim, Lex Orandi, Lex Credendi, Lex Vivendi (the Law of Prayer determines the Law of Belief, which ultimately determines the Law of Life). Thus, a church built purely on considerations of acoustic soundness and seating capacity, one which resembles an auditorium or a convention hall, may actually result in people expecting entertainment and outstanding performances, rather than inspire reverential awe for the purpose of sacred worship. It is no wonder that people are more often found dressed like they are going to the pub or a stroll in the park, rather than coming before the King of Kings, surrounded by His heavenly court. Often, we hear people commenting how a church looks an airplane hangar or a factory warehouse. This is not just a matter of architectural taste but a statement that the theological reality of the building appears opposed to its architecture. When a Church does not look like the Church, rather than revealing the realities of heaven, it reveals a falsity because it’s very identity is not manifested in its physical expression (a factory is not how we would imagine heaven). It might be a mighty fine factory, but as a church, it is not beautiful, it does not reflect the heavenly liturgy.